My dear friend and sister-in-law pinned a T-shirt on pinterest- it says “Ask me about my T-rex” then you can flip the T-shirt over your head and it’s like dress-up pretend play for boys in a T-shirt. (Boys-if any of you read my crafty posts- correct me if I’m wrong?) The T-shirt can be seen here at Crazy dog t-shirts. Anyhow, since she liked it for her little boy (aka my handsome nephew) I wanted to try to make one. 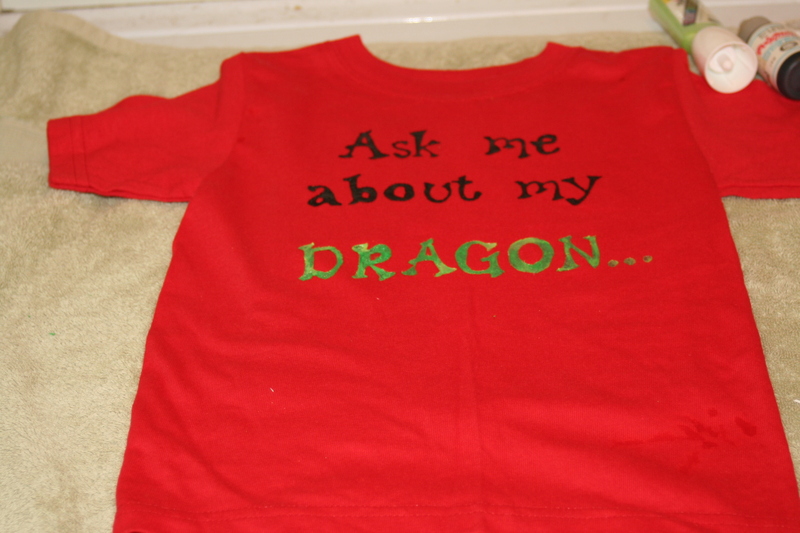 And since he had a thing for dragons when he visited last summer, I changed it up a bit. I picked up a simple T-shirt from the dollar store. 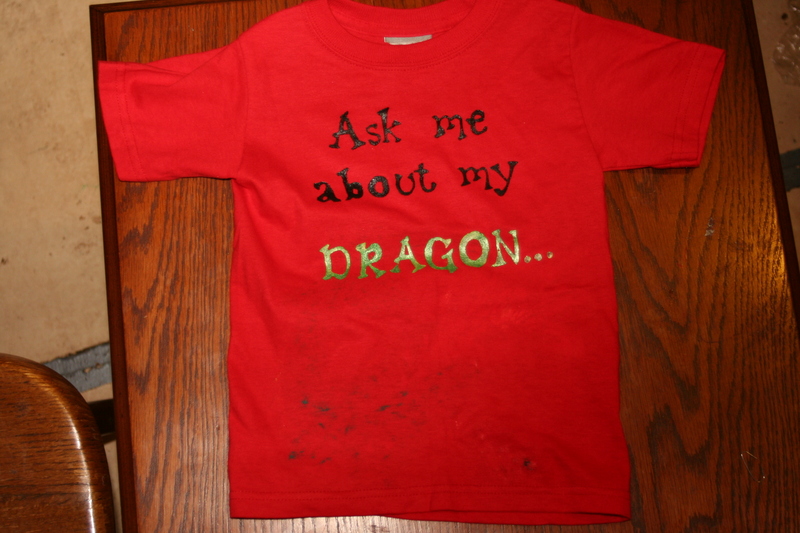 Using some fabric paint and a brush, “Ask Me About My Dragon” went on the front. I used a stencil for the lettering on freezer paper, then cut out the letters and did the freezer-paper stencil thing to keep it nice and neat while painting the letters on the shirt. (Lots of tutorials available online about freezer paper stenciling). If you can do awesome lettering by hand, you can skip this part! On the inside, I had to come up with the dragon. Since he’s only 3, I opted for a cutesy only slightly scary looking dragon- freehand drawing with a bit of consulting to get some dragon look ideas from a few kids books. I drew this on freezer paper as well. Once I liked my drawing, I darkened the basic lines- keep it simple! I transferred a little differently. I cut around the outline of the dragon and a few larger details, like the eyes. Then ironed it on the shirt. so it comes out right when you’re done! After outlining, I lifted more portions of the freezer paper and drew in the main lines as I went to get the basic outline onto the shirt. Then the fabric paint and brush again. One option would be to cut a block of scrap T-shirt in the same size and shape (except for the sleeves) as the front of this T-shirt. 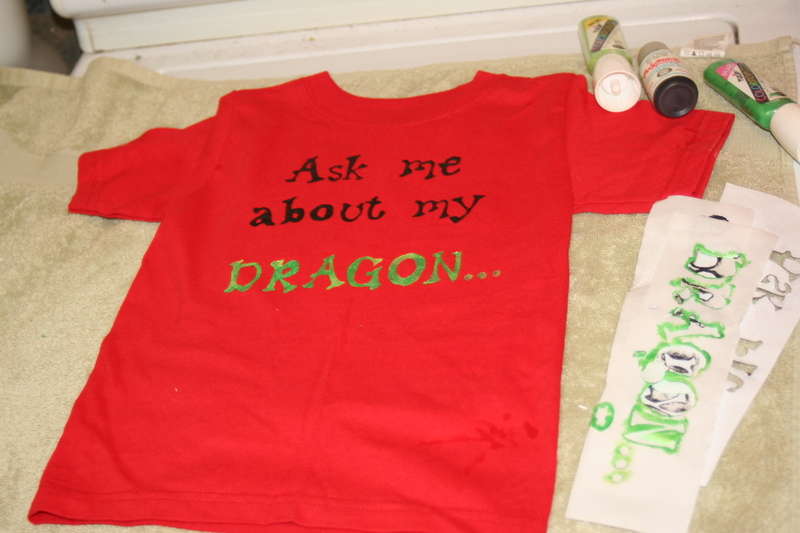 Then paint the dragon upside-down at the bottom, and then stitch it to the inside of the T-shirt- along the side seam, in front of the arm, along the shoulder, and at the neckline, plus across the bottom. The other option would be to cut a strip as wide as the t-shirt but that would fold in half (more detail following). Re-work the seam at the side of the shirt – a slit on each side up most of the way to the armpit. The T-shirt strip I cut would be seamed to the sides that were cut- the strip being twice as tall as the slit and folding in half. It would fill in the gap- so the strip creates a new bottom hem of the t-shirt as well as a lift up flap with the existing T-shirt. probably it would need to be seamed across the center of the T-shirt as well to keep it from sagging. 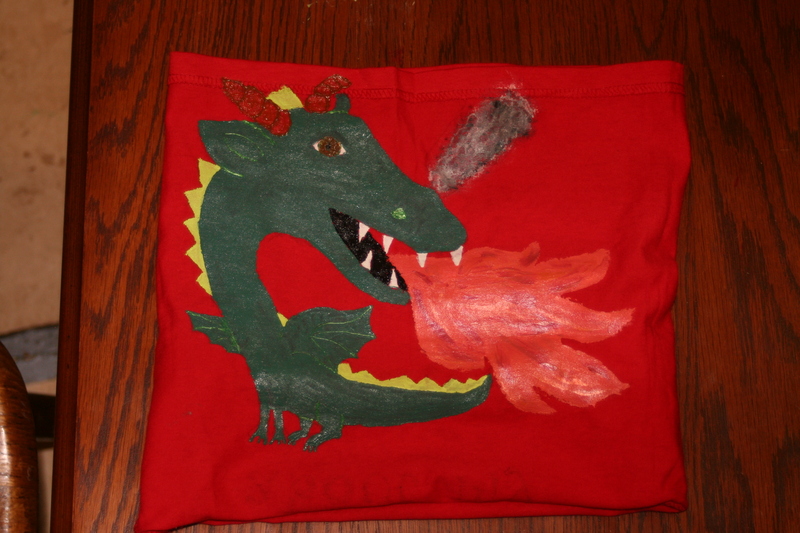 Then velcro on the sides to hold the flap down when it wasn’t being lifted to show off the awesome dragon (or whatever else). You could do an opening mouth for all sorts of critters with the fold this way. More work, but it won’t show anyone’s belly (if you’re modifying this for a girl) and it works for little kids who have heads that are so much larger in proportion to their body, or may not want to put anything over their faces that obscures their vision, or are sensitive to the cold, scratchy fabric paint against their tummies.